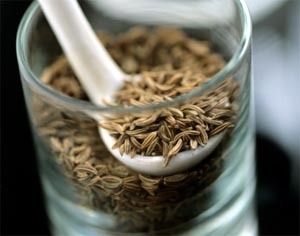 Cumin seed or jeera is seeds of flowering plant Cuminum Cyminum . This plant, native of east India and east Mediterranean, belongs to family Apeaceae. 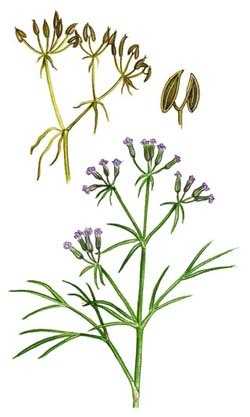 The herbaceous plant Cuminum Cyminum grows to a height of 20-30 cms. Leaves of this plant are pinnate and bear thread like leaflets. The seeds of Cuminum Cyminum have gained their place as main spice in Indian, African, Chinese, Cuban and Mexican cuisines, due to their distinctive popular aroma. It is mainly used to spice and season variety of dishes like curries, chutneys, masalas etc. It is extensively used in India to season dishes. Due to its numerous medicinal properties, jeera is used as an ingredient in many home remedies and Ayurvedic preparations. The strong aroma of jeera or cumin seeds is due to the presence of compound cuminaldehyde. This spice has been praised as jeeraka , jarana and ajaaji for its medicinal qualities in Ayurvedic texts. These names refer to its carminative and digestive properties. According Ayurvedic principles these seeds balance vata and kapha. According to ayurveda jeera exhibits the following medicinal properties. It reduces superficial inflammation and pain. Apart from kindling appetite, it digests food and normalizes vata in digestive system. Reduces pain experienced during indigestion, flatulence or heaviness of stomach . Cumin seeds act on female reproductive system by reducing inflammation of uterus. It is eulogized for its galactogog properties. (Increases milk production in lactating mothers). As it normalizes vata and kapha it acts as an aphrodisiac. It is a skin friendly herb and reduces itching. A fine paste of cumin seeds (cumin seeds ground with water), when applied on boils or aching body parts gives relief from pain. Water boiled with ground jeera has to be given regularly to lactating mothers. This increases breast milk and reduces inflammation of uterus. Boil ground jeera in water and allow it to cool down. Add a pinch of cardamom to filtered jeera water. Gargling with this flavored water helps to keep the mouth fresh, heals mouth ulcers and eliminates foul smell. Roast jeera without oil till it warm. Grind this to a fine powder along with rock salt. Massage gums with this powder. This helps to prevent bleeding from gums and strengthens them. Boil a tea spoon of jeera in a glass of water, allow it to cool. Consuming this water frequently relieves indigestion and flatulence. Consuming powdered jeera with honey reduces colic pain and reduces diarrhea caused due to indigestion. A tea prepared by boiling cumin seeds and a small piece of fresh ginger help to give relief in common cold. Mix a spoon of ground roasted cumin seeds , spoon of fresh ginger juice and a pinch of salt in a glass of butter milk. Frequent consumption of this butter milk helps to relieve piles and sooths inflamed intestine. Patients suffering from irritable bowel syndrome can use pomegranate juice mixed with roasted and ground jeera powder. This helps to reduce frequency of stools and sooths colon. Precaution has to be taken while roasting cumin seeds. Cumin seeds have to be roasted in low heat till it becomes warm and should be taken off from stove when it is sufficiently warm to touch. This precaution helps to prevent the escape of volatile compounds of jeera.